Acupuncture: The Multi-Faceted Pain Reliever Approved by the NHS and recognised as a viable treatment method by NICE (National Institute of Clinical Excellence) in the UK, Acupuncture is widely accepted as an intrinsic wing of physiotherapy, because it constitutes a potent approach to pain management. But, acupuncture works best in conjunction with physiotherapy treatments such as exercise and rehabilitation techniques. Acupuncture is an ancient Chinese treatment that is based on the body’s natural vitality and communications system, Qi (pronounced “chee”), that is said to course across the body in channels called meridians. With blockages in these Qi channels, individuals are prone to suffer from poor health conditions that require acupuncture to restore proper flow. 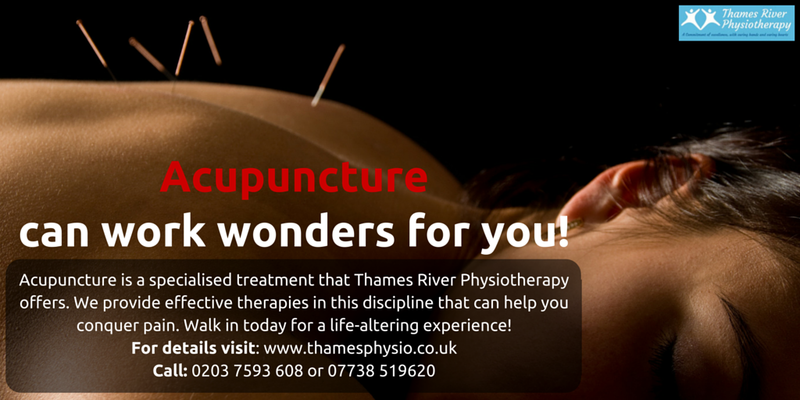 Backed by scientific research and clinical evidence, physiotherapists reveal that acupuncture can help reduce pain by stimulating the brain and spinal cord. Among the list of benefits this method produces natural pain-relieving chemicals like endorphins, melatonin (aids sleep) and serotonin (enhances well-being). Patients can gain instant relief from debilitating pain when these chemicals assist and hasten the body’s healing and recovery processes. Conventional acupuncture involves the use of single-use, pre-sterilised disposable needles of varying widths, lengths and materials into the body at specific points along the meridians. The physiotherapist will determine the locations of these points on the basis of an assessment of the cause of the imbalance. A number of needles may be used during each treatment, and these are typically left in position for between 20 and 30 minutes before being removed. Distal points, that is, areas that are located away from the actual spot of pain, but that possess the potential to help in overall cure are usually added in the foot, or lower leg. Some points that treat general muscle or tendon injuries, bone and joint pains or ligament problems may be also be included, irrespective of the specific pain location. Do I Qualify for Treatment? Recovery rates are quite good with virtually no side-effects, but they depend on the patient’s condition. Chronic conditions require a longer time to heal. People with metal allergies or haemophilia should avoid acupuncture completely. Those with pace-makers are strictly advised to consult their doctors before undertaking this treatment.